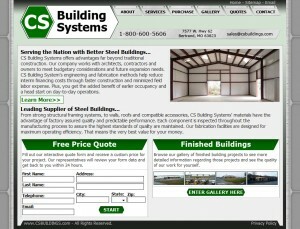 CS Buildings is a large steel building supplier located in Missouri, USA. They needed a website with a quote generator, e-commerce, a photo gallery, and built-in CRM software. The quote generator was interesting because it needed to only show available options, for instance if the chose a specific type of building, only options pertaining to that type would be visible. Additionally values generated themselves based on user input (ie. a 20×10 building can only have 2 or 3 doors and the size is generated by the minimum and maximum margins allowed for a building of that size). The CRM software is a customized VTiger installation that allows emplyees to manage leads that come in from the form, schedule callbacks and manage invoices. The design featured a 3d animation that built the company logo, page changes were handled with ajax and a subtle animation. I really enjoyed this project because for a change I could break free of budget websites and really make a great webapp and site. However delivery of the final product was delayed an entire year when the customer refused to make the final payment. The site is now partially available as a result of him hiring another web master to STEAL the site from my development server. Russell Gadberry also took the extra effort to Google up my grandmother’s phone number to harass and threaten her. So as great of a project as this was, I cannot recommend doing business with CS Buildings. In 2006 The Shelton chapter of the US jaycees contacted me for a website. The site was meant to offer information to both the public and members of the chapter with the ability for members to submit stories and upload photos. The site features an admin panel for editing the site and various scripts to handle the event calendar, forms/member documents, and photo gallery. At the time of creation the site was very limited by its budget but there is talk of a newer and better version so stay tuned.